At 75 Harley Street our goal at the practice is to provide the highest standards of dental care in a manner tailored to meet your specific needs and wishes. 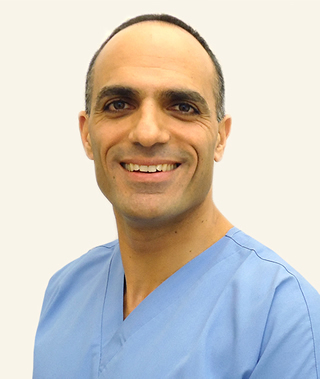 Our principal dentist, Dr Sanei is an American (USA) qualified specialist & carries out a full range of general & specialist Prosthodontic treatments. His specialty includes, cosmetics, crowns & bridges & dental implants. Specialist Endodontist, Dr Shahrzad Rahbaran who qualified from the Royal London Dental Hospital in 1992 and later achieved an Endodontic MSc with distinction. We specialise in helping anxious and nervous patients, so be rest assured you'll be in good hands. Routine dental check-ups to assess your teeth and mouth and to help treat your dental issues. Focused on maintaining the health of your teeth and gums with advanced cleaning & dental advice. Restore teeth towards the back of the mouth that have signs of damage or decay. Get the whitest teeth you can with the best teeth whitening dentist in Harley Street, London. Veneers are thin layers of porcelain made to fit over the front surface of a tooth. Transform your smile! Help restore fractured, chipped or damaged teeth or replace one or more missing teeth. Dental implants offer a high-class, long lasting, permanent solution to missing or damaged teeth. Help save a tooth that has been damaged by deep decay, breakage, or infection. Periodontal disease can lead to you losing teeth. Our dentists have gum disease treatments to help. Alternatively you can book your Harley Street dental appointment online here. Every effort is made at 75 Harley Street to make the patients journey as smooth and easy as possible. From the first phone call or email inquiry from a new patient, to the final appointment, the results of the dental treatments we provide are celebrated by our patients and team alike. We aim to provide the best experience that is tailored to the patient and pride ourselves in exceeding our patients expectations. We are proud of our hard earned success and our credible reputation amongst our fellow professionals and patients alike. We can only put this down to our immense dediciation and interest in our chosen paths and also our genuine empathy and sympathy for our patients with an innate desire to help and improve their quality of life. We are a real advocate in offering all possible treatment solutions to our patients and spend a significant amount of time discussing the pros and cons to allow our patients to choose options that are best for them. We do not treat two patients the same and we listen to their needs and concerns and design a plan that addresses their specific issues. Our plans also provide the patients with a guide as to what will happen and when as well as providing a financial timeline. The treatment time can be slowed or sped up depending on patients time constraints or financial restrictions and we will always be open to discussion. We place a huge emphasis on preventive dentistry which starts at the very beginning of each patients journey with their initial assessment. We like to educate patients with diet and hygiene advice so they can help prevent potential dental situations. We feel preventing new dental issues is our responsibility and take huge satisfaction in the knowledge that our beautiful dentistry could potentially last for the rest of a patients life. We will never compromise or sacrifice the quality of care and set our fees to reflect this. This allow us to provide the very best skills, equipment, materials and environment which allows us to provide excellent care for our patients in Harley Street. We are very open and transparent with our dental charges for treatments and all possibilities are discussed and accounted for so there are never any surprises once our patients start their journey with us. We believe for a specialist dental practice with the calibre of our team in Harley Street, London and the facilities and service we provide, our fees are very competitive and ensure long lasting treatment success every time. This is confirmed by our patients returning and the reviews they very kindly provide us. Our success has been built largely on word of mouth from our patients who very kindly recommend us to their friends, family and colleagues as well as other local dentists in the London area referring their more complex cases to us for an opinion and treatment. We are further humbled by the fact that many of our patients who have left London to move abroad but continue to return to us for their routine examinations and treatment. We build relationships with our patients which are based on trust. We take time to know our patients needs concerns and wishes. If you would like to register as a new patient with our dentists, please complete our registration form. We have lots of useful information inside our patient education section, from Pregnancy to Smart Eating read all the facts here. The team at 75 Harley Street are highly qualified, patient focused and commited to offering a first class service. The face of dentistry is continually evolving, see examples of what highly skilled modern dentistry can do for your smile in Harley Street.